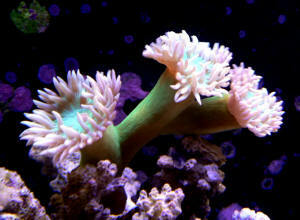 Dendrophylliidae: Characteristics of the Family: Most species lack Zooxanthellae. 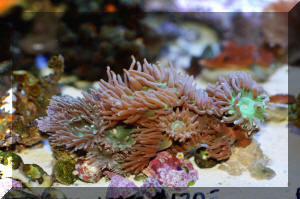 In fact this family contains the most common Azooxanthellates species found on reefs. 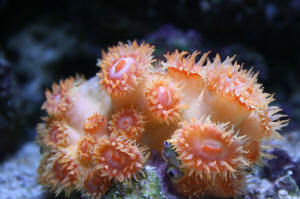 They're either solitary or colonial, with corallites are mad up of walls that are porous, mainly filled with coenosteum in life, fused with distinct (Pourtales plan) septa. 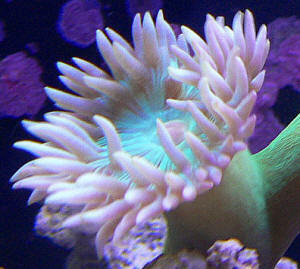 Of the genus with photosynthetic endosymbiotic algae, Turbinaria often finds its members employed in ornamental aquatics. As far as ahermatypic species of this family, only Tubastrea is regularly imported. Dendrophylliids are found in tropical and non-tropical regions of the worlds oceans, some of the ahermatypic, Azooxanthellates ones to a depth of a 1,500 meters. 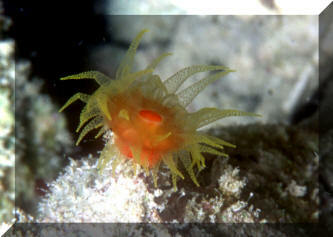 The genera Turbinaria and Tubastrea are prominent shallow reef species in large parts of the tropical Indo-Pacific. 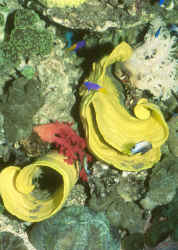 Some Dendrophylliids are inconspicuous, but found in the tropical West Atlantic. 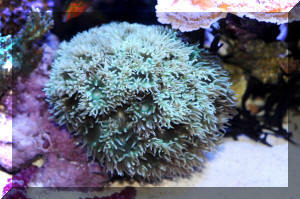 Genus Balanophyllia: Solitary polyps, calyces appear round in cross section. Balanophyllia sp. 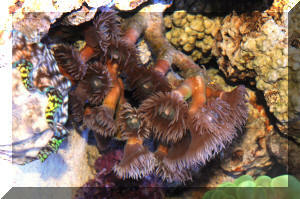 Either B. hawaiiensis or B. cf. affinis. Here off Hawai'i's Big Island at night, though can be found in caves and crevices open during daylight hours. About one inch in all dimensions. Genus Dendrophyllia: Near impossible to distinguish from Tubastrea w/o microscopic analysis of corallite skeletons. Dendrophyllia californica Durham, 1947... a coldwater species. Pic taken at SIO by BobF. Dendrophyllia sp. Nuka Hiva, Marquesas, Polynesia at about forty feet, under an overhand during the day.